On Wednesday, 22 July 2009, a total eclipse of the Sun is visible from within a narrow corridor that traverses half of Earth. 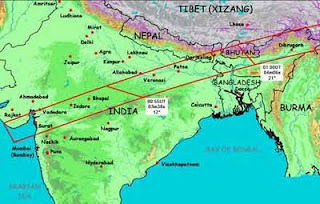 The path of the Moon's umbral shadow begins in India and crosses through Nepal, Bangladesh, Bhutan, Myanmar and China. A Total Solar Eclipse will be visible in India on July 22, 2009 from early morning 05:28 hrs to 07:40 hrs (Indian Standard Time). The total solar eclipse will last nearly four minutes — from 6.26 am to 6.30 am — in India and the sun will not be visible at all. In India, Total Lunar Eclipse will be visible in Madhya Pradesh, Bihar and Northeastern States. According to NASA, the solar eclipse on July 22, 2009 is a ‘Total Solar Eclipse’ and the Moon's umbral shadow on Sun begins in India and crosses through Nepal, Bangladesh, Bhutan, Myanmar, China and ends in the Pacific Ocean. The total solar eclipse in India will be visible in regions around Bhopal (Madhya Pradesh) and Patna (Bihar). 1. 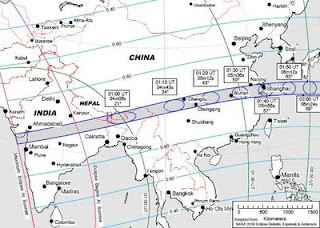 The dark blue double line with circles indicates the path of Total Solar Eclipse which includes central India, Bhutan and parts of China. 2. The grid area is of partial eclipse. All Images and information courtesy to NASA. Image above shows, most of the Eclipse passing through India, and that's very good news for Indian Citizens. Watching Eclipse with naked eyes, and using unconventional methods like X-Ray Films, Smoked Glass is very dangerous. Safe and Tested Solar filters Eclipse Goggles is supposed to be best as suggested by NASA and many astronomy related websites. I found a source - www.astronomyindia.org/shop who are the best resource in India. Don't go for cheap alternatives, as it is related to your precious eyes. Happy Viewing.